Dealer Laurie McCants is a stickler for detail: "I"m a numbers person. I can tell you 24/7 this is where we need to be. So many dealerships just wing it." 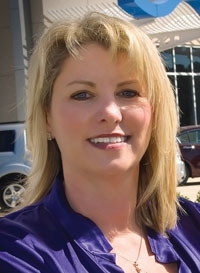 Laurie McCants, a New Orleans Honda dealer buffeted by natural and man-made disasters that have rocked her city and her business, is obsessive about finding ways to keep top-notch employees. When Hurricane Katrina slammed into New Orleans five years ago, McCants lost a third of her work force at Honda of Covington, just north of the city across Lake Pontchartrain. Some left because they had lost their houses to the storm. Others went to work in construction in the building boom that followed the devastation. "We had a finance guy leave to go cut trees," McCants says. Tree companies were paying up to $5,000 a week, a figure no dealership could match. "Another finance guy left to go rescue people off rooftops. He had this hero mentality," McCants says. This year, she says, "I had a couple of guys threaten to leave to go clean up oil," lured by the prospect of making a quick buck from BP's spill operation in the Gulf of Mexico. So McCants -- a focused, numbers-driven manager who found time to open a restaurant -- is exploring ways to make her dealership as attractive as possible, such as annuities for employees who stay for many years. But she has found no silver-bullet solution. Honda of Covington is still performing around the national average on turnover of sales personnel, which means about 40 percent of the sales staff leaves each year. "I've thought about all kinds of things," says McCants, 46. "One of our action plans for 2010 was to improve salesperson retention, so we tracked it on a monthly basis vs. Honda nationally. It's just a difficult thing." While she searches for long-term solutions, McCants is turning the dealership into a kind of center for continuing education where employees can develop skills to do better work. Subjects include personal finance, management training and techniques to overcome negative thinking. Not all classes are mandatory, but the dealership operation ones are. Employees unwilling to master the latest customer relationship software or used-car pricing systems won't be working at Honda of Covington for long. "We fired a couple of older salespeople," says McCants, a soft-spoken woman who exudes a quiet determination. "They had sold cars forever and were likable, likable guys. But they refused to use the technology. No matter how many Webinars we hooked the guys up with, they weren't going to use the computers." McCants admits that some of her employees probably think she's a pain in the neck. "I'm very analytical, very by-the-book as far as ethics, compliance and morality -- probably too much, if you ask my managers. Almost any customer they touch, it's going to get back to me if they screw up in any way." She is a stickler for processes and a firm believer in the benefits of new technology. She's at her computer at 5:30 every morning reviewing the digital record of everything that happened at the store the day before. "Before I've left the house, I've checked sales' customer satisfaction score vs. district and national, and I check the service scores and the daily sales retail delivery registration reports vs. the competition," McCants says. "I'm a numbers person. I can tell you 24/7 this is where we need to be. So many dealerships just wing it." The attention to detail has kept Honda of Covington humming along consistently as the No. 2 Honda dealer in the New Orleans area. It set a record in 2008, selling 1,203 new vehicles and 406 used ones. The store is on course to shatter that mark this year, McCants says. She knows the industry from both sides -- factory and dealer. The native of Hattiesburg, Miss., worked for American Honda Motor Co. as a sales manager in New Orleans and Houston and later worked at the corporate office in Torrance, Calif. Asked which side of the industry she enjoys more, she says being a dealer wins hands down. "Not to slam the factory side, but it's a lot of meetings and a lot of meetings," McCants says. "On this side there's more action. You can react to something easily, whereas on the corporate level, you've got to take it to a vote. "On the retail side, it's never dull. Employees keep you slammed 24/7 with personal and professional challenges." It was in California that McCants learned to surf. She was also an avid swimmer and tennis and basketball player before a back injury sidelined her. She has channeled her energies into other activities. She and her husband, Wayne, who is not involved in the daily activities of the dealership, have just opened a restaurant in a renovated historic building called The Oaks Plantation in Abita Springs, La. McCants confesses that she does little cooking. She's too busy minding dealership business. • The Five Dysfunctions of a Team by Patrick Lencioni: A leadership fable about a CEO who tries to unite a management team in disarray and save a company in the process. • Think Like a Manager by Roger Fritz: Employees who get promoted to management often lack the training to manage people. • Crown Financial Ministries: 10-week course in personal financial management with Christian principles. McCants thinks education for employees will improve operations. This year Honda of Covington started offering employees 10-week classes on personal finance training from Crown Financial Ministries. "Of course, it's not mandatory, but if people have money problems, they're not good employees if they're stressed to the max," she says. The dealership also has a management training curriculum using such books as The Five Dysfunctions of a Team by Patrick Lencioni and Think Like a Manager by Roger Fritz. The dealership has offered management training, including a recent session about negativity. When hiring, McCants says she seeks "character before skill, which is very difficult." She has heard all the cliches about the auto dealership business. She is fond of a movie, Flywheel, where a used-car salesman decides to quit telling lies and turn his life around. "I've heard the phrase that car dealers lie and cheat for a living," says McCants. "I refuse to accept that. You do what you think is right and try to sleep at night."